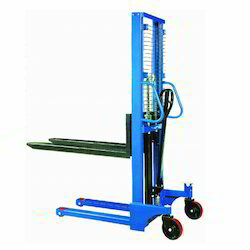 Providing you the best range of hydraulic hand stackers with effective & timely delivery. We are among the distinguished names in the industry as the wholesaler and trader of Hydraulic Hand Stackers, which are used in warehouses and stores for stacking of goods. The offered stackers are manually operated and are sturdy. They are meant to decrease the down time of work in industries. Being made from high grade metal, they are ideal for heavy duty applications and have been checked for assurance of quality as well. Looking for Hydraulic Hand Stackers ?